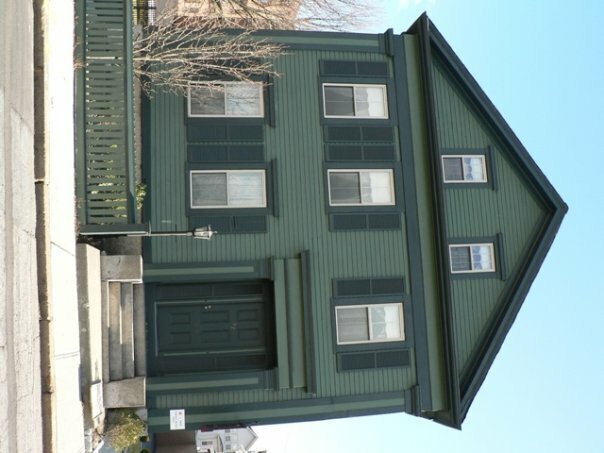 Fall River, August 4 1892: Lizzie Borden stands in the sitting room of her house. She yells, ‘Someone’s killed father.’ A domestic nightmare begins. In 2005 I found a pamphlet in a second-hand bookstore. 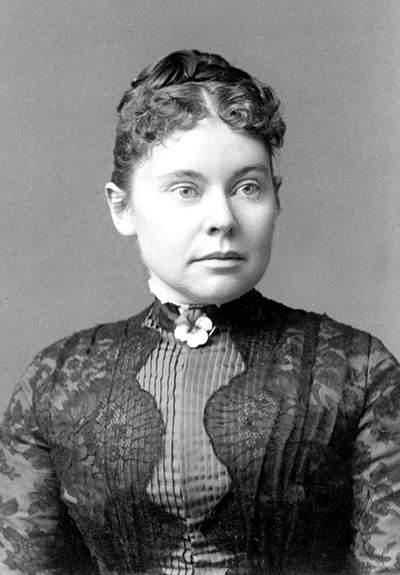 On the front cover, a photo of Lizzie Borden. I opened it up. It was pulp text: I read about how Lizzie was accused of brutally murdering her father and step-mother with an axe; how she probably committed the crimes naked; that written on the wall in the victim’s blood was a demand for money (which just so happened to be the same value as the inheritance Lizzie and her older sister, Emma, would receive now that their father was dead). The story went on but I wasn’t really interested. I closed the pamphlet. Then I looked at Lizzie’s photo again. This is the part where I tell you that she spoke to me right there and then, said, ‘There was no more love.’ I didn’t answer her right away. I put the pamphlet back on the shelf and left the store. I no longer remember the title of the piece but I now know it was riddled with inaccuracy. I went home. That night I dreamt about Lizzie. I woke up and began jotting down the images that had come to me. That was the beginning of my first project, See What I Have Done, a manuscript that has taken ten long years to write. Ten years of creative obsession that has taken me to the scene of the crime (now a delightful bed and breakfast) and where I’ve slept in Lizzie’s bedroom to try and fit the pieces of her puzzle together. There is a lot of information about the 1892 Borden murders that you can find all over the internet. Sources: trust some, don’t trust most. I recommend you head over to lizzieandrewborden.com and begin there. He was still bleeding. I yelled, ‘Someone’s killed father.’ I breathed in kerosene air, licked the thickness from my teeth. The clock on the mantle ticked ticked. I looked at father, the way hands clutched to thighs, the way the little gold ring on his pinky finger sat like a sun. I gave him that ring for his birthday when it no longer fit me. ‘Daddy,’ I had said. ‘I’m giving this to you because I love you.’ He had smiled and kissed my forehead. I looked at Father. I touched his bleeding hand, How long does it take for a body to become cold? leaned closer to his face and tried to make eye contact, waited to see if he might blink, might recognize me. I wiped my hand across my mouth, tasted blood. My heart beat nightmares, gallop, gallop, as I looked at father again, watched blood river down his neck and disappear into suit cloth. The clock on the mantle ticked ticked. I walked out of the room, closed the door behind me and made my way to the back stairs, shouted once more to Bridget, ‘Quickly. Someone’s killed father.’ I wiped my hand across my mouth, licked my teeth. 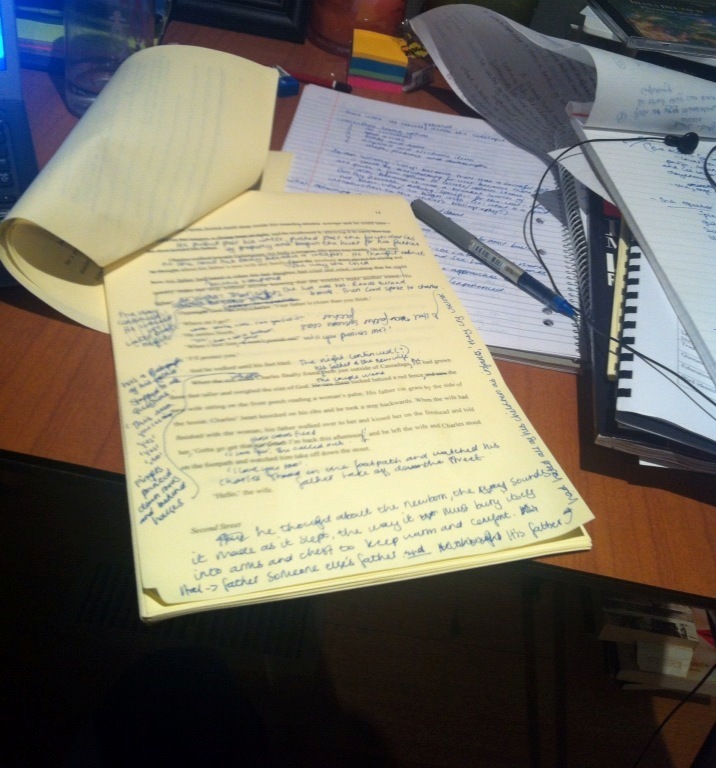 Redrafting a chapter in 2013. After a few years of a narrator not hitting his mark, I set about rewriting a whole section of the manuscript (around 25,000) and things took an unexpected turn: it took almost two years and another 40,000 words to fix the issue I was having. In this photo, I had no idea what was ahead of me. This draft nearly made me chuck it all in.